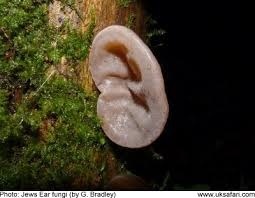 I'm not sure if you already know, but the second and forth pictures of fungi on this page (https://www.newforest-life.com/new-forest-fungi.html) appear to be a specimen known as Jew's ear (I don't know why it is called this) or if you don't like the anti-Semetic connotations it is also known as Jelly ear. The forth pic shows them while young and the second pic when they are older. They favour old elderberry, but also grow on Beech and Elm. They are delicious cooked and taste rather like the round 'Straw-mushrooms' used in Chinese cookery, they can be eaten raw too and can be frozen or dried and re-constituted without much ill-effect to them. In addition to this, I have heard that they also have a mild anti-septic / anti-biotic effect. If you do decide to verify the identification and do some more research before you try some for yourself, make sure they are plump and juicy or they may taste slightly bitter. 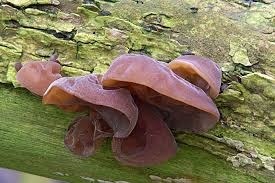 Thank you for your lovely pics of fungi in the New Forest. Join in and write your own page! It's easy to do. How? Simply click here to return to New Forest Fungi.